A future where logging trucks and other heavy vehicles are quiet, cheap to run and environmentally friendly? That’s the possibility that Gisborne-based infrastructure company Eastland Group is about to explore, with co-funding from the NZ Government. Energy and Resources Minister Megan Woods announced last week that Eastland Group has been awarded NZ$177,000 from the Low Emission Vehicles Contestable Fund, administered by EECA. 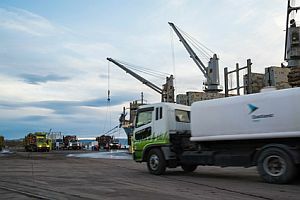 The grant will go towards the purchase of New Zealand’s first all-electric water truck, which will be used to suppress dust at Eastland Port and log yards around Gisborne. But the project has larger ambitions: it will gather data on the vehicle’s economic and environmental benefits, and showcase electric innovation to logistics businesses and the public across the central North Island. Last year, with support from the fund and Eastland Group’s shareholder Eastland Community Trust, Eastland Group established a region-wide network of high speed electric vehicle chargers. They previously committed to ensuring at least 75 percent of their non-commercial vehicle fleet would be electric by 2019 – a goal they’ve reached a year ahead of schedule. The project cost has been scoped at NZ$379,000, and includes the purchase of an electric terminal tractor and an on-site charging point. The vehicle is expected to be delivered and operational by the end of the year.